The best way to get your children excited about reading is to read WITH them … the younger the better. As they get older, it will be important for your kids to see YOU reading, too. Here are some ideas to get you started. Make reading a DAILY experience. When a child is very young, it is the sound of your voice, not the words that they love. Reading with your child (even before they are born) helps you and your child bond. discover new things, and create precious memories, TOGETHER. Click here to read more. Here is a list of great books to share with preschoolers. 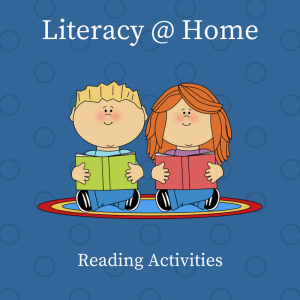 Build Reading into an activity your kid loves. A Reading Tub® visitor sent us this idea: when you’re watching TV, turn on the subtitles function. It’s an easy, non-threatening way to match something they want (TV) with something you want (reading). “You get used to the subtitles very quickly and it is a big help.” Credit for the idea goes to Juliana Lovejoy. Create a Family Reading Night. You have a Family Game Night, why not Family Book Night? There are lots of ways to make reading together a lot of fun. Enjoy this interview with Margaret Eaton on Just One More Book and you may hear some other great ideas that fit your family. Plan a family adventure to the library. Kids love adventures, so get them involved. Make plans together, to prepare for and then celebrate the first trip to the library. Plan a book party when you get home? Be sure to prepare the kids BEFORE you go. The library is a unique place, and you’ll need to take the time to explain how a library works, just as you explain the dos and don’ts of other places, like church and visiting family and friends. Click here to read more. Pick out some Award-winning books. While the Newbery and Caldecott Medals are the most widely recognized awards for children’s literature, they are by no means the only “premier” awards for children’s books. Each year, literacy professionals, reading advocacy groups, private foundations, and companies bestow more than fifty-five national awards. Children’s books win recognition in broad categories, such as best illustrations; in individual genres, like historical fiction; in specific languages, such as Greek; and in every target audience range, from infant to young adult. In addition to the national awards, library media specialists or reading associations in each state sponsor at least one award. Although the library and reading associations facilitate the program, in nearly every case, it is students who select the winners. Mirror Classroom Processes at Home. Reading, like walking, is a skill that is learned, with lots of practice. The more we practice, the more skilled we become. If you can complement the work your child is doing at school, you can maximize his/her learning. Click here to read more. Give Your Child Confidence to Read. Recognizing the letters on a page is only one part of reading. The more crucial part is having the confidence to keep trying, and to learn new words. We learn language by hearing the SPOKEN word, learning to read can be encouraged that same way. Click here to read more. See also Tips for Raising Readers, Literacy Help for Parents, and Using the Library.